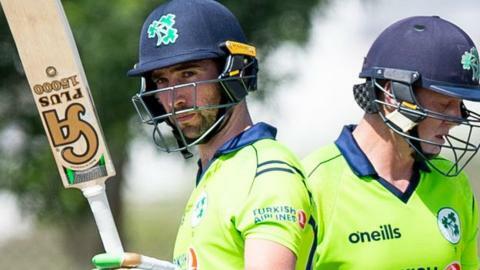 Batsman Andrew Balbirnie believes there is a "good feeling" in the Ireland squad as they prepare for a nine-game run of matches against Afghanistan. The Irish side will play a number of T20 and ODIs during the tour and conclude with a Test match in March. Top-order batter Balbirnie is looking forward to the challenge of adjusting to the three formats. "At this stage it will mainly be a mental adjustment to switch in and out of the formats," he said. "All formats are difficult in their own right, but for me the principles of batting mainly stay the same, like hitting the ball as straight and late as possible. "There's a good feeling amongst the squad at present - Paul Stirling has been excellent so far, leading from the front with the bat and demanding high standards in everything we do. "It has been great having the new around. However, it's my first trip that I've been representing 'the oldies' in the football matches, which is a big shock to the system." Ireland arrived in India for the series on the back of a dramatic last-ball victory over the Netherlands in the T20 Quadrangular Series in Oman on Sunday. Dubliner Balbirnie scored his highest score in T20 Internationals - 83 runs from 50 balls - in a man-of-the-match performance. "My game plan going out to bat against the Netherlands, after losing Paul [Stirling] early, was simple - give myself a couple of balls and then assess where my best scoring options were and go on from there," the 28-year-old added. "It may sound obvious, but as a batting unit we found that the more time we had in the middle and acclimatising to conditions, the better we batted. "However, we were disappointed with our batting in the middle overs against Scotland and felt we underperformed, so to get a good run chase under our belts against the Netherlands was very satisfying." Thursday's opening T20 international against the Afghans will begin at 13:00 GMT. They will play a further two T20 matches followed by five ODIs and then the Test match which will start on 15 March.